It’s a sure sign that spring has arrived in Seward when the street sweepers come out to clean up the gravel that has accumulated all winter along the roads and bike path. Friends return to town after their winter travels, and seasonal business owners find themselves suddenly up to their elbows in endless projects as the snow thaws. Jason and I are no exception! Late evening sunset on Resurrection Bay, just south of Seward, Alaska. There may still be some snow in the forecast, but new leafy greens are starting to push out of the soil. It’s only a matter of time until the mountainsides will be green and guests will be sea kayaking around the yurts at Shearwater Cove. Bookings are coming in fast for the 2019 season, so be sure to reserve your Alaska lodging sooner than later! 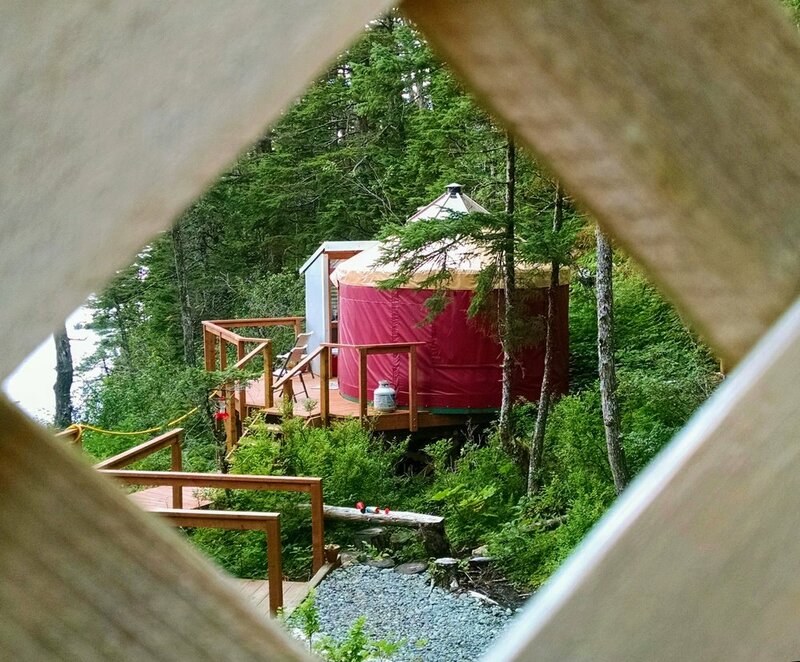 If you are looking for lodging off the beaten path that provides an authentic Alaskan experience without sacrificing creature comforts, then check out our yurts at Shearwater Cove! Our smaller, 1-2 person yurt at Shearwater Cove. Shearwater Cove is ten miles by water from Seward, Alaska. The Cove is home to 4 yurts that are only accessible by boat and fully off-grid. Our nightly rental price includes your roundtrip water taxi transportation/boat tour, the yurt rental, and unlimited access to our fleet of sea kayaks and gear for exploring the surrounding coastline of Resurrection Bay. Kayaking destinations include Fox Island, Humpy Cove, Kayakers Cove, and Sandspit Point State Marine Park. Yurt amenities include a memory foam queen mattress, fully outfitted kitchen for preparing meals, heater, running water, and private shower and compost toilet on the yurt deck. So book a stay with us and get out there and adventure! Breathe the ocean air, explore in a kayak, and return home to your warm, cozy yurt to prepare a hot meal and take a hot shower. That’s right, our off-grid yurts are equipped with hot running water, heaters, and even memory foam mattresses. Experience the joy of being totally comfortable in a wilderness setting. Unplug and reconnect in the magical setting that is Shearwater Cove. See what other guests have to say on Trip Advisor.